By olduvai in Survival on March 17, 2018 . There is nothing like seeing clumps of repining super-sized tomatoes on the vine – That’s the sign of a happy, growing garden. But tomatoes can be problematic and prone to certain issues. Blossom end rot, nutritional deficiencies, blight, and invasive hornworms are just a few of the problems a gardener may have when growing tomatoes. Many of these issues can be corrected early on by giving the tomato the right growing conditions. Some of the most popular types of tomato varieties planted are the beefsteak tomato, Celebrity, Early Girl, and the Cherry Tomatoes. The tomato plant can grow up to 6 feet tall and requires trellising or support. Tomatoes typically take about 85 days to harvest. And to get those big, delicious red orbs to grow, it requires a lot of nutrients. Choose a fertilizer that has a balanced ratio of the three major elements, such as 10-10-10, or where the middle number (phosphorus) is larger than the first number (nitrogen), such as 2-3-1. Tomatoes are heavy feeders and usually do need fertilizer unless your soil is very rich. 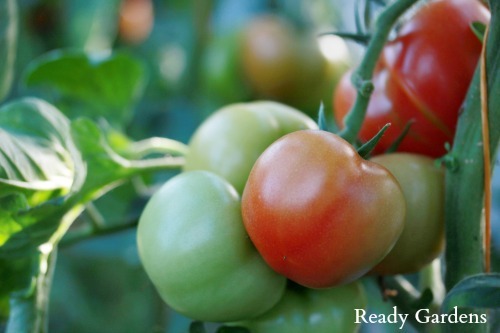 Use some o these gardening tips to ensure your tomato harvest is the best one yet! 1. Choose the right varieties. There are many types of tomato varieties to choose from. One that I always recommend is the heirloom varieties. These seeds have been around for generations and were bred for flavor, adaptability and growing performance. As well, many of these seeds are open-pollinated and the seeds can be saved for the next harvest. This ensures you have plenty of tomatoes to eat fresh, preserve or make delicious sauces with. Tomatoes love bright locations where they receive 10 hours or more of sunlight. Full morning sun is always the best location, but tomatoes will do well with some afternoon sun too. As well, ensure that you have properly spaced your plants.